OrganoLeaf Omega 3 Review – Is This Product Safe To Use? OrganoLeaf Omega 3 is a supplement said to support immune response and minimize the symptoms of chronic skin ailments and inflammation. Its softgel capsules are lemon flavored and contain high DHA/EPA. It contains balanced DHA and EPA levels to help support and maintain cardiovascular system health. DHA (Docosahexaenoic Acid) and EPA (Eicosapentaenoic Acid) are vital polyunsaturated fats with lots of benefits the body. What is OrganoLeaf Omega 3? This is a high-quality, professional grade dietary supplement drawn from pelagic fish. The multipurpose formula functions to promote nerve and brain health, improve the stability of joints, reduce inflammation, relieve persistent skin complications, boost immune function, and support cardiovascular health. OrganoLeaf Omega 3 comes in a natural lemon flavor. It is packed in bottles each containing around 60 softgel capsules. A bottle of OrganoLeaf Omega 3 can last a single user for 30 days. For the supplement to be effective, users are urged to use it as per the provided instructions. What is the Company Behind OrganoLeaf Omega 3? The company behind OrganoLeaf Omega 3 is known as OrganoLeaf. OrganoLeaf has been creating a wide range of formulas designed to improve user health for many years. According to OrganoLeaf, this supplement contains Omega 3 and many other essential and powerful fatty acids proven to minimize inflammation as well as promote overall health. The company boasts of making this formula using all-natural ingredients. Moreover, OrganoLeaf claims that the supplement does not have artificial elements that might harm the health of users. Also, the company says that the active ingredients in OrganoLeaf Omega 3 are tested in the laboratory by third parties to guarantee maximum potency, purity, and best-quality. What are the Ingredients Used to Make OrganoLeaf Omega 3? OrganoLeaf Omega 3 Review – Does It Actually Work? OrganoLeaf Omega 3 is made using effective and clinically-proven ingredients. More importantly, these ingredients are professionally incorporated in balanced amounts into the formula. This guarantees effectiveness and positive effects. Additionally, OrganoLeaf Omega 3 doesn’t contain artificial colors and flavors, chemical preservatives, binders, and many other materials that have the potential to harm the health of users. This pharmaceutical grade formula is claimed to be backed by physicians among other experts in the clinical world. All these shows just how effective OrganoLeaf Omega 3 must be. 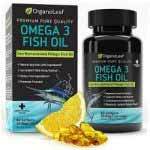 What are the Pros of OrganoLeaf Omega 3? What are the Cons of OrganoLeaf Omega 3? OrganoLeaf Omega 3 appears to be a great fish oil supplement. It is designed to promote optimal health in both men and women. Its ingredients have the ability to maintain a healthy nervous system and proper brain function. Moreover, its essential fats have been to shown to contribute to joint flexibility, support visual function, promote proper functioning of the brain and nerves as well as promote healthy heart function. It contains vital fatty acids proven to help with asthma and reduce inflammation. The recommended dosage should never be exceeded. Additionally, nursing or pregnant mothers, individuals with medical conditions, and children below 18 years should talk to their physicians prior using this dietary supplement. Note that OrganoLeaf Omega 3 It isn’t meant to treat, prevent, treat, or diagnose any disease. Also, the product lacks Food and Drug Administration evaluation.